Job seekers and professional resume writers now have an outstanding new how-to resource with the publication of Resumes for Dummies, 7th edition. The new edition offers up all new content and samples, and is a fresh approach to writing resumes that land the interview faster. The newest version of Resumes for Dummies includes 85% new content and all new resume samples, with over 40 samples appropriate for specific industry positions, employment levels, and life's hurdles. 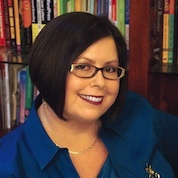 Laura DeCarlo, an award-winning Certified Master Resume Writer and president of the membership-based organization Career Directors International (CDI), has been changing the way job seekers and professional resume writers think about resume writing for over two decades. Whether she is running award-winning job placement programs, publishing how-to industry guides and training programs, or coaching resume writers to win their own resume writing awards, she has been a trailblazer in making extraordinary resumes accessible to everyone. 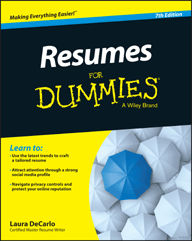 When she was presented with the opportunity to become the new author of the 7th edition of Resumes for Dummies by John Wiley & Sons, Inc., it was an outstanding opportunity to share her how-to approach to a global audience, educating everyone in what a modern day interview-generating resume could and should really include. To that end, the newest version of Resumes for Dummies includes 85% new content and all new resume samples, with over 40 samples appropriate for specific industry positions, employment levels, and life's hurdles. DeCarlo says, "Resume writing is personal marketing no different from when a company with a product to sell launches their brand to the world. While job seekers are doing this on a smaller scale, they need to be able to convey what makes them unique and what bottom-line value they bring to the employer. It's nothing short of an advertising brochure that tells the company what's in it for them when they pick that individual." However, a resume will never be as open-ended as a marketing brochure and has several constraints that make it a vastly unique marketing tool specific to the employment market. DeCarlo adds, "The new resume is a vastly confusing tool with mixed messages that the candidates needs to stand out and sell themselves while at the same time making sure that key words are addressed and that the format is easy to scan and quick to read. Individuals writing resumes for themselves or professionally can find the whole situation to be a maze and a balancing act." That's where Resumes for Dummies, 7th edition comes in. Anyone ready to make a career change and get into a second career. 1. Overcome any employment and career challenge. 2. Show employers exactly what they are looking for in a resume and a candidate. 3. Leverage up-to-date resume samples from the industry's top resume writers. 4. Get past writer's block in figuring out just what to say and how to say it. Resumes for Dummies, 7th edition, is now available through book stores and online book sellers such as Amazon.com. Laura DeCarlo is available for media interviews and quotes. Her bio can be viewed on the CDI website. CDI is a global membership organization that positions career and resume professionals for dynamic success as both practitioners and business owners. CDI is focused on championing the industry's cause for credibility and visibility; fostering exceptional success in every generation of career and resume professionals; and cultivating the career superhero that exists within each one of us.